Today we kicked off an initiative to have fewer dogs that need homes. In a perfect world our four legged friends would not need to tell you their stories and ask to be taken into your families. The fewer dogs in need, the better. With the support of, and coordination with a large construction site, we kicked off a program to spay and neuter all dogs living out there. This is one of many construction sites populated with dogs. And the population of stray dogs is exploding with development and growth in the Middle East. 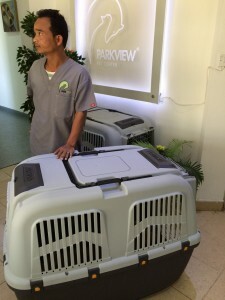 We hope to see other initiatives to spay and neuter all stray dogs. But we were not there soon enough: There is currently a young litter of puppies. Luckily, all will be going to their new homes in the next weeks. 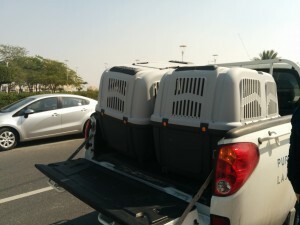 For now they are safe and well cared for and a shelter for the puppies is now under construction. And word is another litter was just born. We do not want to see anymore born out there. To prevent the scramble to protect and place puppies, is the need to control population growth of dogs that will be subject to suffering and abuse. It is that simple. The first two gents were brought in today after a smooth and successful rescue/capture. They will soon be returned to their home and the life they know — where they are fed, safe and have socialization. We’ll keep you updated on the progress as we bring more in for spaying and neutering. But we could not do it without your continued support. Even a small contribution goes far to secure the welfare and safety of our four legged friends. Thank you all! ©	Desert Hound Express. All rights reserved.